Easter Bunny arrived early, more money in your pocket! The Reserve Bank’s 0.25% drop on Tuesday (to base rate of 3%) gave those with a secure job even more power to capitalise on opportunities thanks to the Global Financial Crisis. Congratulations to CBA for being the first to cut their rates by 0.1% only minutes after the RBA announcement. Plus some even better news- one year safety net for those who fall into tough times by the 4 major Banks, icing on the cake in what proved a big week for South Australian property. What a week, what a month, what a turnaround! 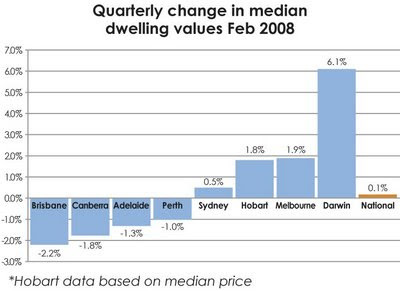 Demand is hot while prices are OK (with some outstanding exceptions). We have seen a return to multiple buyers on properties with multiple offers. So you may ask why? “Our explanation is that prices are fair, affordability is high, rents are rising, Government hand outs are peaking and property is in short supplyÉand property in S.A. is being seen as one of the simplest and safest assets”. Just a reminder that Spring 08 saw the supply of property peak while demand stalled. T&T talked about property prices softening at a time when the official Data was all positive, but now the reverse is true. This weeks report from RP Data shows the latest stats but we think prices have firmed and are rising in the first home buyer segment. While the full RP Data report is found at www.insidestory.toop.com.au, here are the main details for you to look at.